A study undertaken in 2010 on behalf of the Independent Scientific Committee on Drugs on the harm that the misuse of drugs causes in the UK, showed alcohol to be the most harmful. The study assessed 20 different types of drugs on how much harm they cause to individuals, others and society as a whole. The results showed that alcohol was found to be the drug that causes the most harm (overall harm score 72), with heroin (55) and crack cocaine (54) in second and third places. This may come as a surprise as alcohol is legal, but when you stop to examine some of the key facts about alcohol, it is soon becomes obvious why it causes the most overall harm. 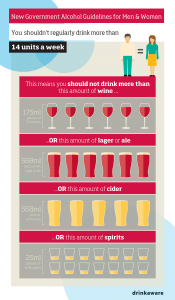 There are more than 9 million people in England who regularly drink more than the recommended daily limits, and 7.5 million are not aware of the damage their drinking could be causing. In 2014 there were 8,697 alcohol related deaths in the UK which was almost 2% of all UK deaths that year. Alcohol is one of the three biggest lifestyle risk factors for disease and death in the UK and is a causal factor in more than 60 medical conditions. It is responsible for 10% of the burden of disease and death in the UK. With 1,008,850 hospital admissions in 2012/13 where alcohol consumption was cited as the primary reason for admission or a secondary diagnosis, alcohol is clearly putting a heavy burden on the NHS. That is 6.7% of total admissions in that year. The costs to society as a whole are estimated to be around £21bn per year, £3.5bn of which is spent on the provision of NHS services to deal with the effects, £11bn tacking alcohol related crime and £7.3bn is lost in work days and productivity costs. 22% of all A&E admissions in England were alcohol related in 2009. The presentation below contains the statistics from this page as well as an array of additional statistics relating to alcoholism in the UK. Either view the presentation using the arrows or click on the link below to download. Alcohol plays an indirect role in many deaths during the year. In 2013 260 people were killed in drink drive accidents and over a third of pedestrians killed in road accidents had been drinking. Alcohol misuse is a factor in 30% of suicides each year and 53% of victims of violence said their attacker was drunk.